One of the most mysterious collegiate secret societies on the Yale University campus in New Haven, Connecticut is the Society of Book & Snake. Founded in 1863, it´s the fourth oldest secret society at Yale. Book & Snake uses an interesting mix of ancient and esoteric symbols to convey occult meanings that only the initiated can properly understand. By decoding these symbols we´ll see how Book & Snake´s art and architecture encodes the very secrets this collegiate secret society was founded to protect. 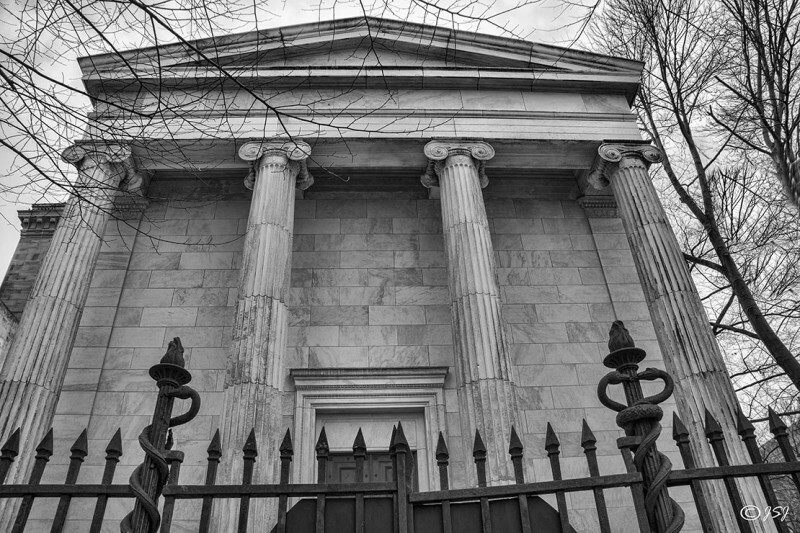 Façade of the Book & Snake tomb on the Yale University campus in New Haven, CT. Conspiracy theorists insist that secret societies are made up of elite and wealthy families who rule the world and manipulate historical events for their benefit. 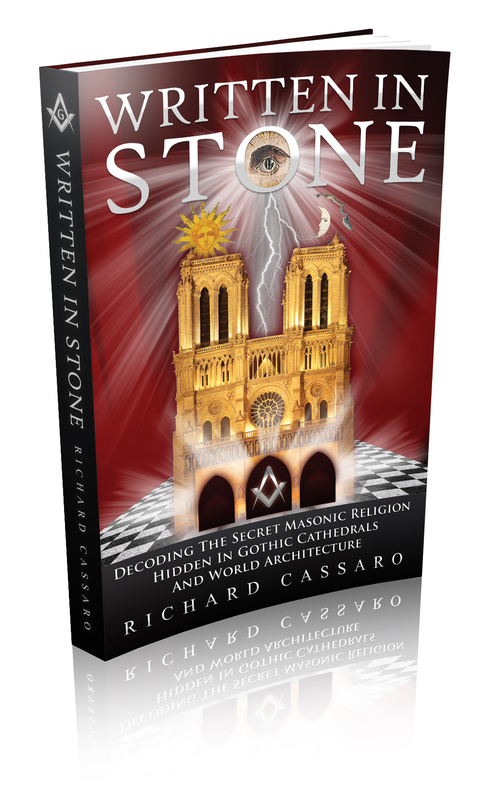 But the symbolism encoded into their art and architecture indicates that these secret societies were originally founded for a more noble purpose—namely, to initiate new members into an ancient “Sacred Science” wisdom-teaching that was shared worldwide in ancient times; and to help these new members achieve the so-called “Great Work” of spiritual transformation, which is the primary aim of this wisdom-teaching. The “Triptych” façade on the Skull & Bones tomb (1856) mimics the Triptych façade of the ancient Egyptian Shrine of Seti II. 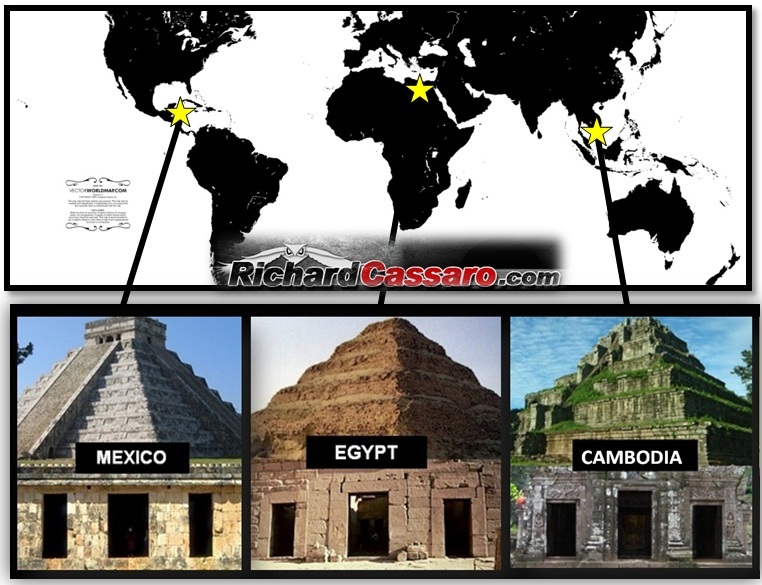 In my 2011 book, Written in Stone, I showed how ancient temples built by far-flung civilizations—especially the pyramid cultures—all shared this same three-in-one pattern. I dubbed this pattern a “Triptych” (a phrase I coined) and I showed how the universality of “Triptych Temples” marks evidence of a Universal Religion or Sacred Science shared worldwide in Antiquity. 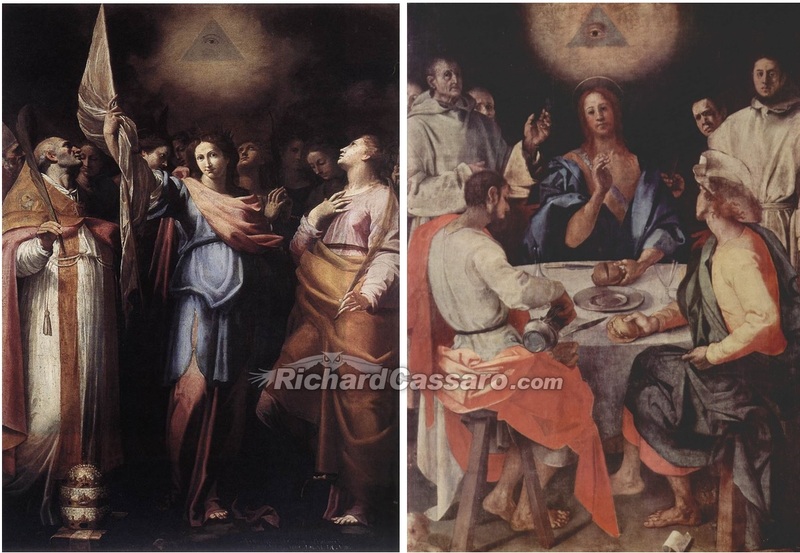 By modeling their meeting places after ancient Triptych Temples, collegiate secret societies like Skull & Bones were showing an affinity with, and a connection to, the ancient Sacred Science teaching. 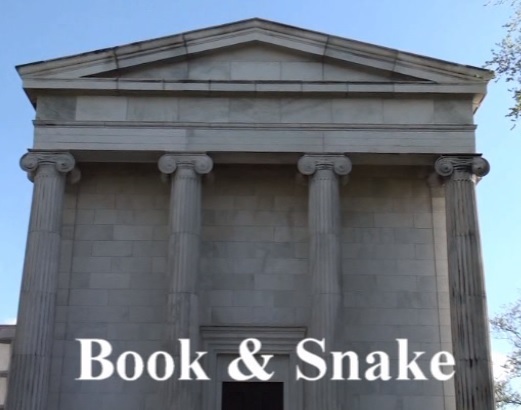 Another important collegiate secret society on the Yale University campus is Book & Snake. With its white marble exterior, the Book & Snake tomb (which serves as the society´s meeting place) was designed to resemble the ancient Greek temple of Nike, made entirely of white marble. Left: Ancient Temple of Nike, Greece. Right: Book & Snake Tomb, Yale University, New Haven, CT. This is one of many connections that links Book & Snake to ancient Greece, a center of philosophy, art, architecture, and sacred geometry, where the Great Work of spiritual transformation was practiced for thousands of years. In the ancient Greek Mystery Schools, the very basis of the Great Work was personified by the myth of the hero Theseus slaying the Minotaur, a metaphor that describes an initiate´s higher eternal Self (the spiritual soul) mastering his / her lower animal self (the material body). 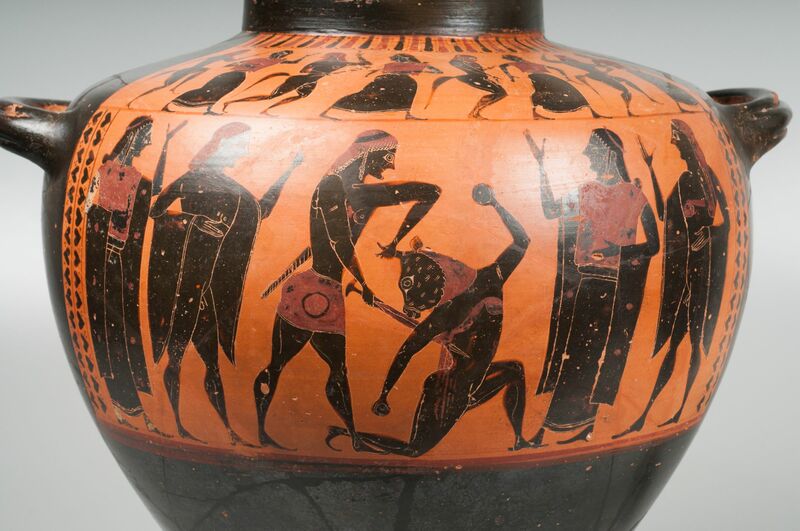 Ancient Greek pottery depicting the hero Theseus slaying the Minotaur. With this aim in mind, the perfectly cut, smooth white marble ashlars that constitute the Book & Snake tomb seem to have served both a symbolic and a practical purpose. Like the ancient Greek Temple of Nike on which it is patterned, the Book & Snake tomb is composed of smooth white marble ashlars. 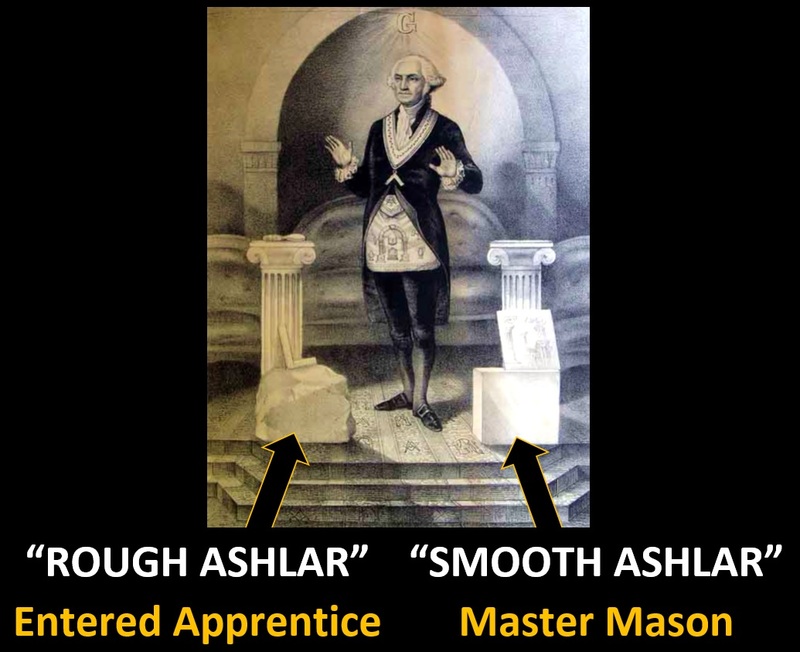 But the smooth white marble ashlars do more than symbolically convey this spiritual transformation; they magically “charge” the Book & Snake tomb, consecrating it with the same current of metaphysical energy that arises within it from initiates practicing the Great Work. Containing metaphysical energy within a confined space creates a concentration of power and intention—which helps to awaken some of the sublime energies within the body that stimulate transformation. For example, the “magic circle” of a practicing magician serves to contain energy inside a “sacred space.” Ancient stone circles like Stonehenge in England seem to reflect an ancient era when magic circles were understood and practiced by our ancestors. Left: The magic circle of the magician. Right: The ancient stone circle or magic circle of Stonehenge in England. Spiritual ascension is the aim, and this aim is symbolized (and achieved, in part) by the upward thrust of the four Ionic columns that grace the Book & Snake tomb´s main entrance. 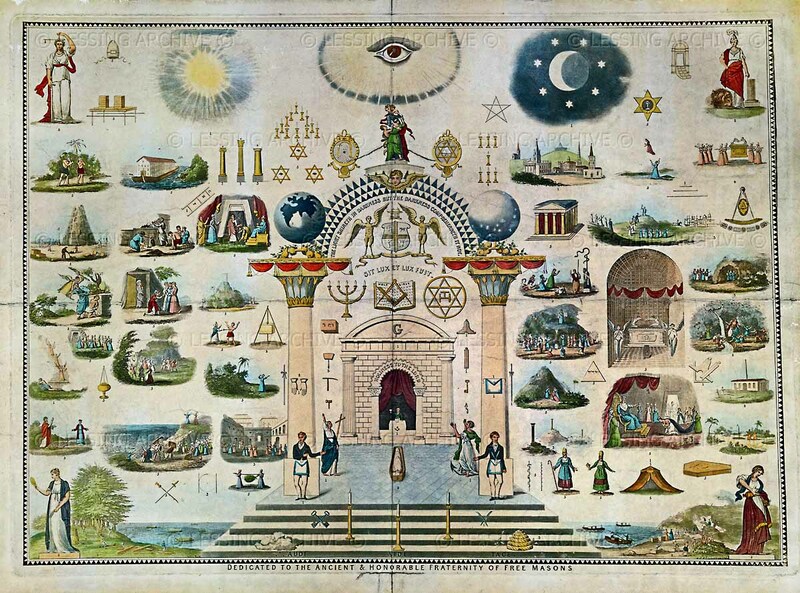 Seasoned occultists use these columns as “ascension vehicles,” and in Freemasonry the columns are depicted as “ladders” by which the initiated can transcend the material world, gain access to the heavenly spiritual realm, and attain Nirvana. 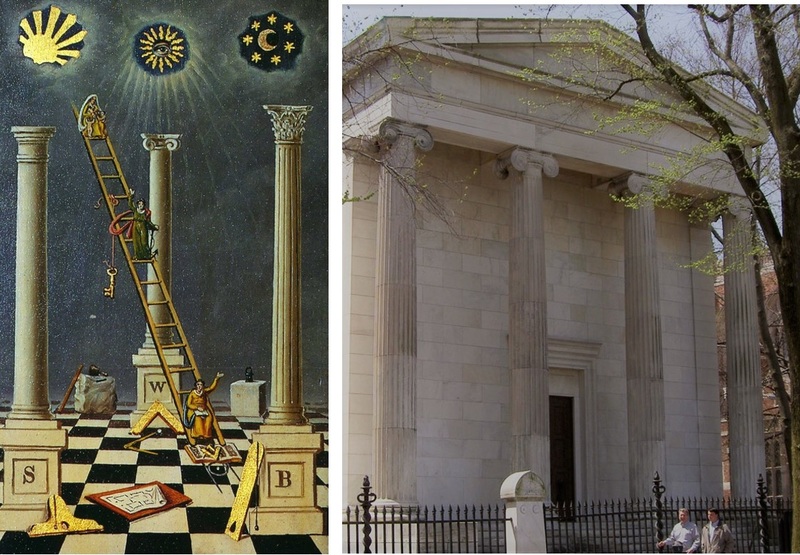 Left: Masonic Tracing Board associating columns with ladders, symbolically conveying the act of spiritual asension. Right: Book & Snake façade depicting four Ionic columns. 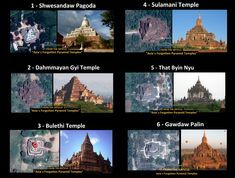 The four columns on the Book & Snake façade support a massive triangle-shaped pediment. 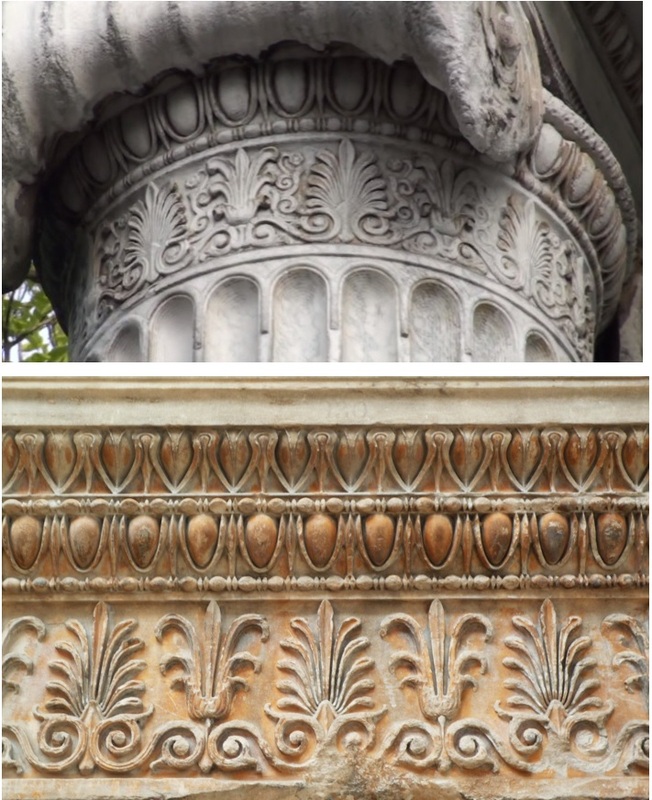 Stylized sets of “anthemion and palmette” leaves decorate the capitals (see image below) , forming an alternating pattern of balanced duality that was celebrated in ancient Greek art and architecture. The Greek Philosopher Heraclitus said that everything in Nature is composed of balanced duality; everything in nature has an opposite, a double with which it exists in harmony. Heraclitus wasn´t alone; this “pairs of opposites” teaching formed the basis of most Greek philosophy. It´s one of the meanings behind the anthemion and palmette pattern. Top: Stylized sets of anthemion & palmette leaves decorate the capitals of the columns on the Book & Snake tomb. Bottom: Anthemion & palmette was an artistic motif celebrated in ancient Greek art and architecture. 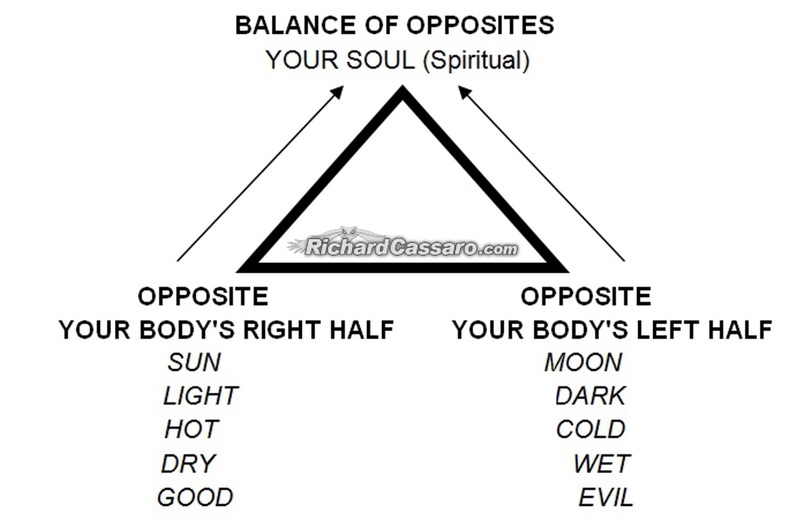 Everything has a solar “right half” representing light, male, fire, balanced by a lunar “left half” representing dark, female, water. As I´ve explained in my books, lectures, videos and online articles for close to two decades, this is the meaning behind many Masonic Tracing Boards, which depict a solar right side (marked “Jachin”) balanced by a lunar left side (marked “Boaz”). Masonic Tracing Board showing sun, moon, and centered Eye. To truly understand and know something, including ourselves, we need to recognize this doctrine of opposites; we need to be able to see things from both sides of the equation, thus “centering” ourselves in perfect balance. The alternating pattern of anthemion & palmette leaves symbolize this uniting of opposites formula that forms the basis of the Great Work. 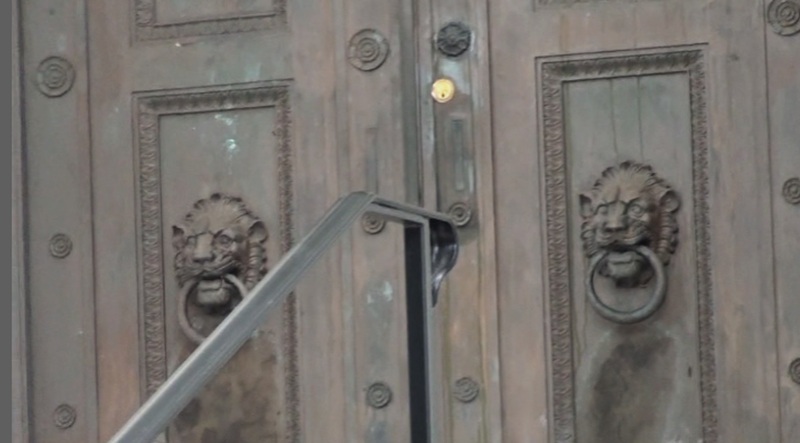 Two giant bronze doors, each one decorated with a lion mask doorknocker, bar entry into the Book & Snake tomb, with each lion holding a circular ring in its mouth. A twin set of lion mask doorknockers decorates the entry into the Book & Snake tomb. These lions are an abbreviation of the “twin lion statues” that decorate the entrances to ancient temples worldwide (as I show in my books Written in Stone and The Missing Link); from the Hittites in ancient Anatolia; to the Chavin culture in the ancient Andes; from the ancient Hindus in India; to the ancient Egyptians in Africa. In China, the guardian lions were called Foo Dogs, and they symbolize the “pairs of opposites” – ying and yang. 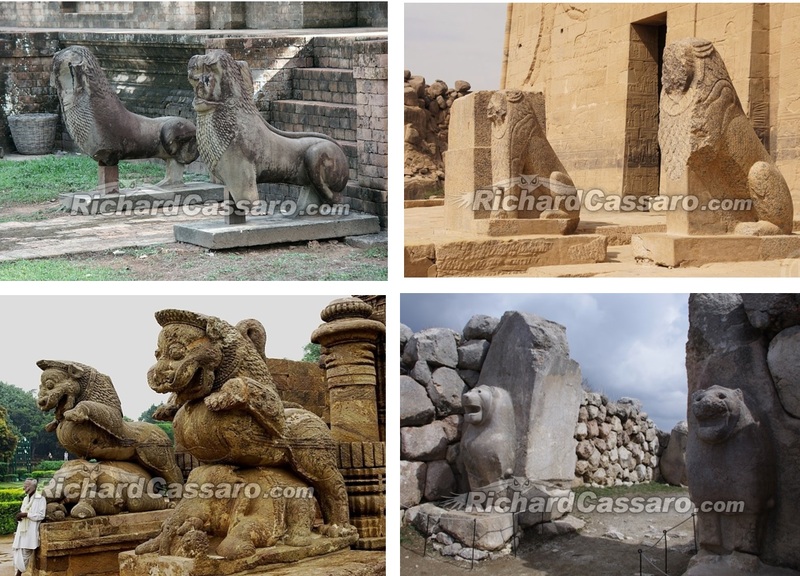 The twin lion statues “motif” has gone unrecognized by scholars and researchers, as I´ve been pointing out my books, videos, lectures and published articles for close to two decades. As the king of beasts, the lion is both great and terrible. With its golden coat and radiant mane, the lion is the personification of the sun, symbolizing bravery, nobility, strength, and valor. And yet the lion is a “shade-loving” mainly nocturnal hunter, cruel in its ability to kill and devour its prey. In short, the lion symbolizes the very “balanced duality” that every Book & Snake initiate presumably strives to achieve. 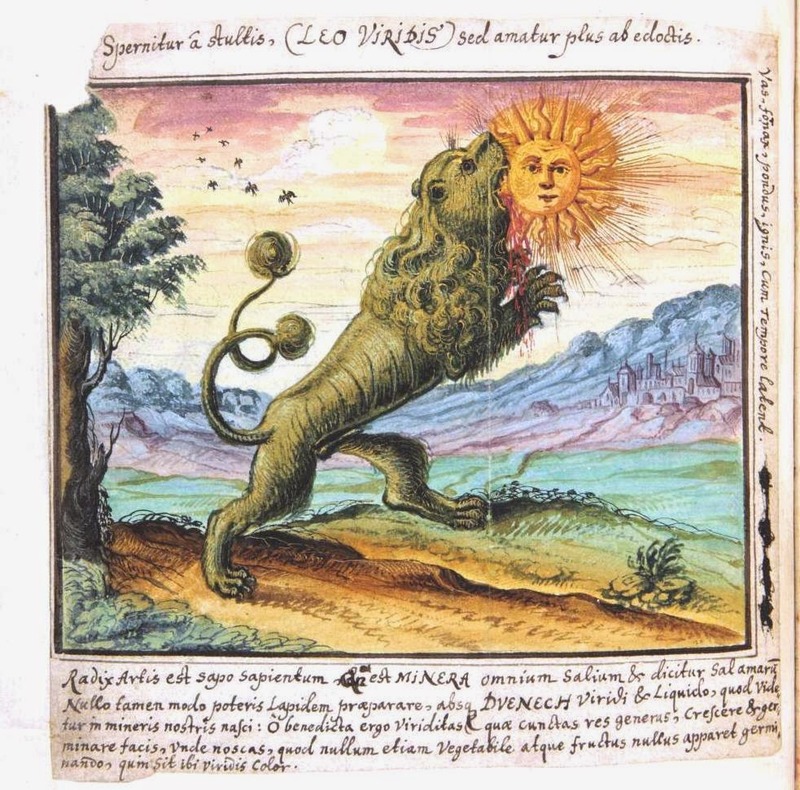 “The Green Lion Devouring The Sun” is a common alchemical image from centuries-old texts, such as the Rosarium Philosophorum (1550). This balanced duality is expressed in part by the imagery visible on the imposing wrought-iron fence that surrounds the Book & Snake tomb. 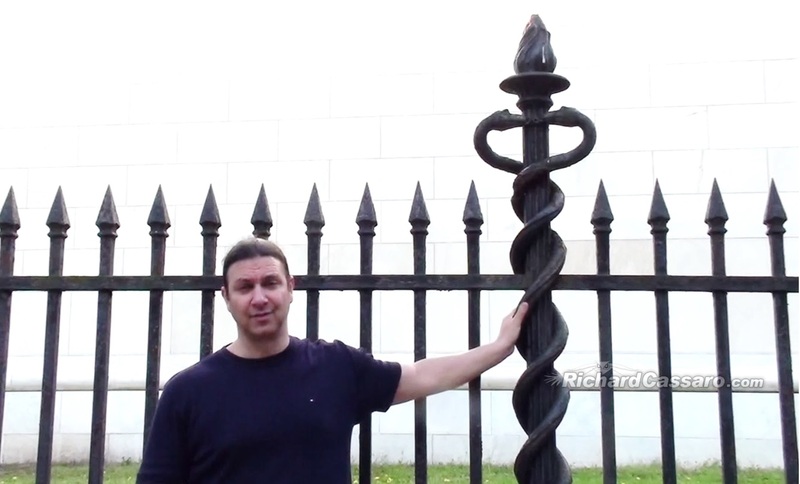 The fence is decorated with 18 massive caduceus posts. The caduceus is one of the world´s most powerful occult symbols. It´s also one of the most enigmatic. For centuries, operative Freemasons encoded the caduceus into the art, architecture, and symbolism of the churches, castles, and cathedrals they designed and built. Primarily, the caduceus relates the occult anatomy of man, a wisdom that (surprisingly) few modern students of the occult recognize. 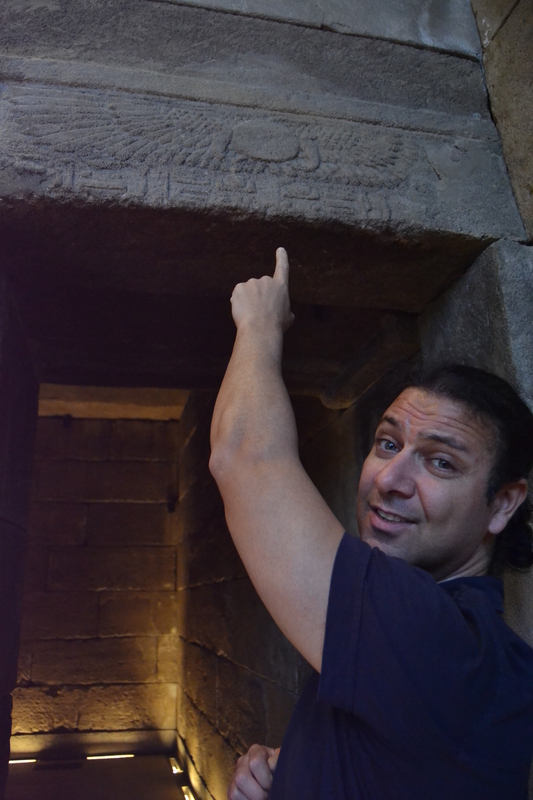 Author Richard Cassaro holding one of the Caduceus posts in front of the Book & Snake tomb. The caduceus also conveys the teachings of kundalini yoga, an ancient Hindu system of meditation directed toward awakening our Third Eye, a sixth sense organ hidden in the human forehead—a Third Eye that, when activated, endows us with the ability to see our inner, eternal nature. 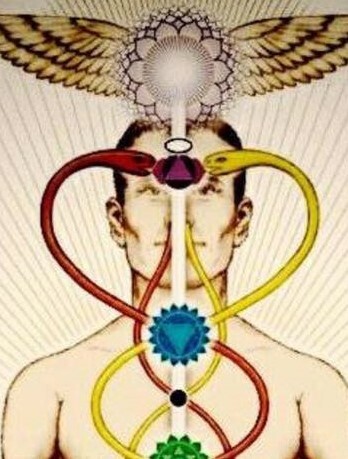 In one aspect, the caduceus conveys the teachings of kundalini yoga. In my work, I´ve shown how in some instances a pine cone symbol, signifying the pineal gland (the name modern science has given the ancient “Third Eye”) often appears atop the caduceus, symbolizing our Third Eye. Caduceus symbols with pine cone on top, signifying the Third Eye. 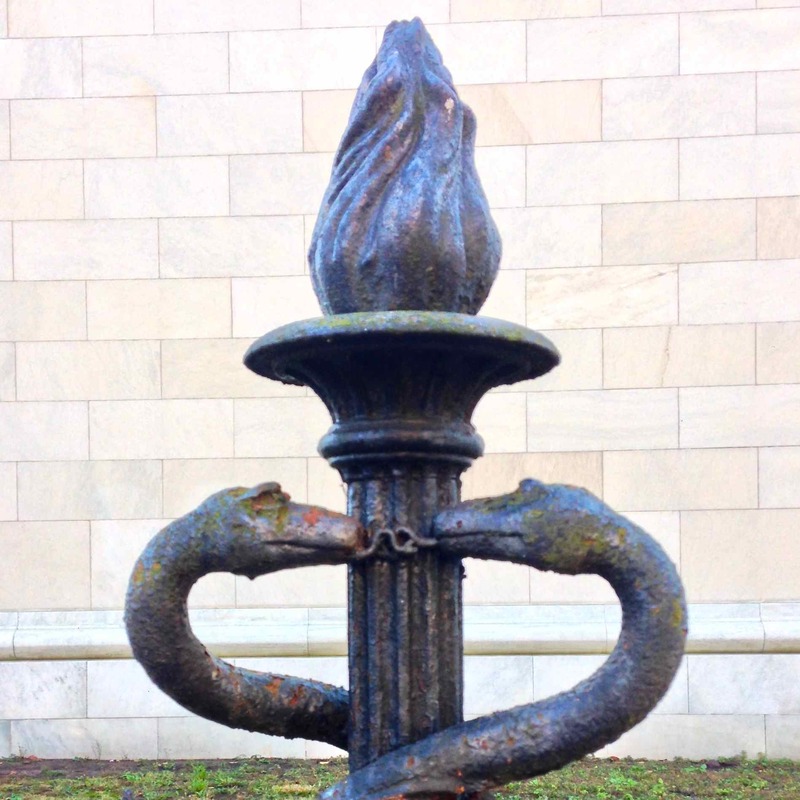 Here at the Book & Snake tomb, the caduceus “pole” is not just a pole, but a flaming “torch.” Exoterically, the torch symbolizes light and life, and, by extension, immortality and enlightenment. Esoterically, the torch symbolizes the inner soul, the centered higher Self beneath the changing world of duality in which the lower self lives. The vertical pole is a flaming “torch” when viewed closeup. Fire is one of the four classical elements of ancient Greece, and some Greek philosophers considered it the first and most fundamental, the source of all existence. Heraclitus regarded the soul as being a mixture of fire and water, with fire being the higher noble part and water the lower ignoble part. He believed the goal of human existence is to rid one´s self of water and become pure fire. In doing so, one becomes an “Olympian,” a god holding the Olympic torch of triumph. 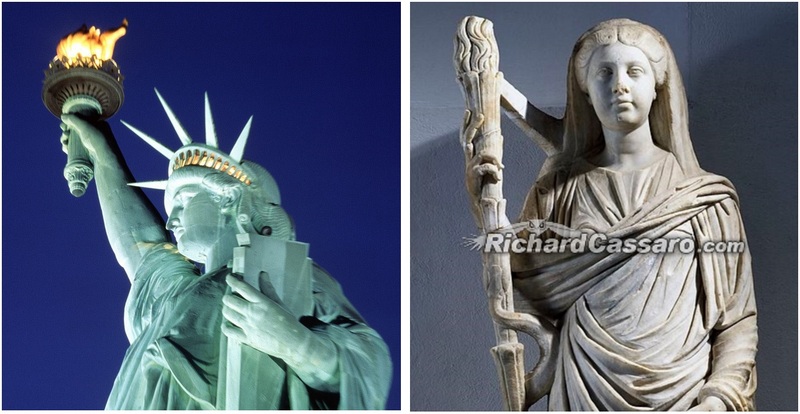 The Statue of Liberty is based on an ancient Greek original. Patterned after an ancient Greek original, the Statue of Liberty holds a torch upward, conveying the “life” and “freedom” of an Olympian. 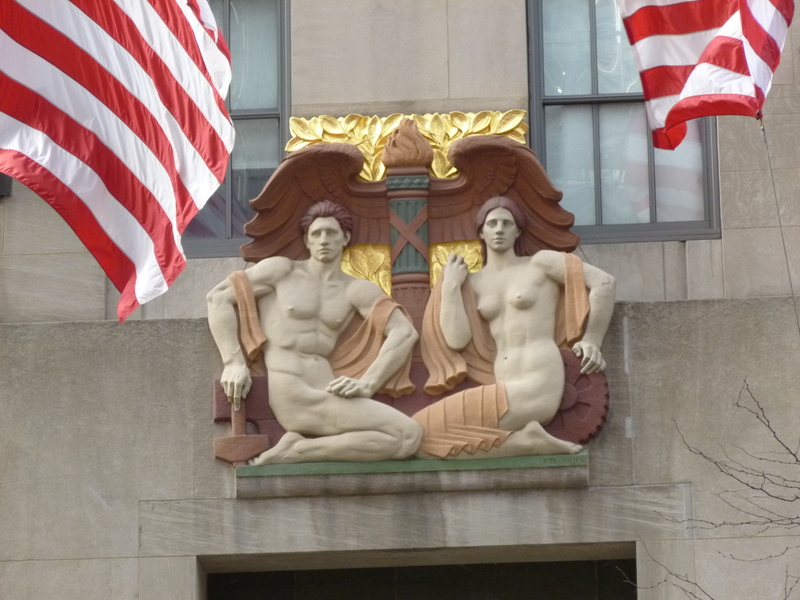 A massive caduceus appears encoded into the architecture of Rockefeller Center in New York City, built in the early 20th century, showing a torch centered between twin symmetrically balanced male / female opposites. 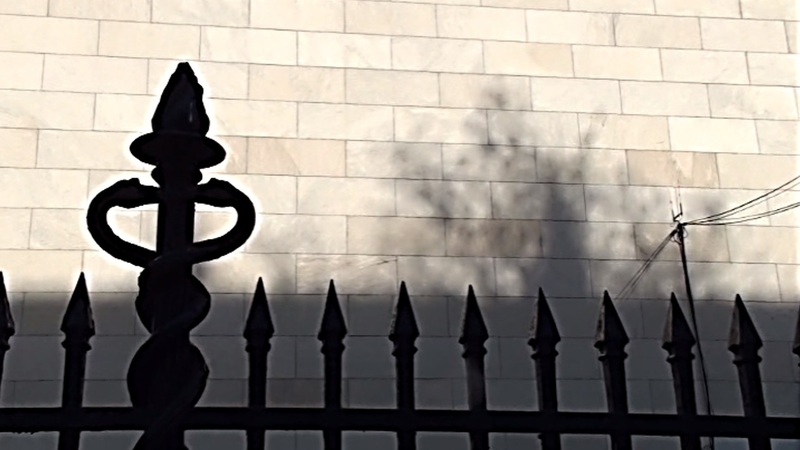 A caduceus appears on Rockefeller center in New York City, built in the early 20th century. On the reverse side of the U.S. dime, we see the torch of illumination, flanked by a symmetrically balanced set of branches—an oak branch on one side and an olive branch on the other. The reverse side of the U.S. dime shows a caduceus-like symbol—a torch flanked by twin branches, an oak branch and olive branch. At the Book & Snake tomb, this same “balance-of-opposites-around-a-torch-in-the-center” theme is conveyed by the caduceus posts, and it´s echoed in the massive triangle pediment atop the building. Like the caduceus, the triangle is a three-in-one symbol, showing twin opposing forces, symbolized by the twin lower points of the triangle, unified by the apex into a single whole. 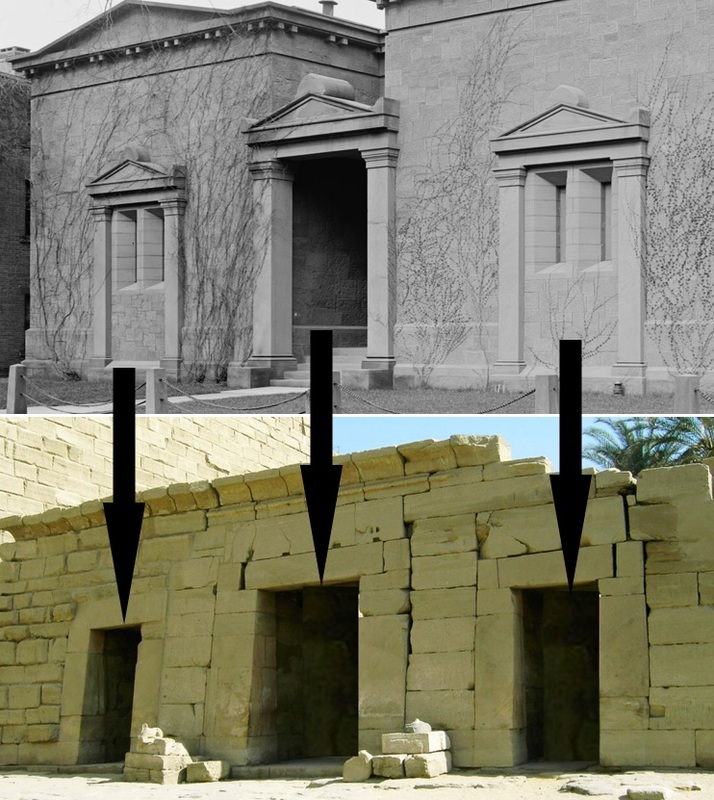 The triangular pediment on the Book & Snake tomb is a three-in-one symbol, just like the caduceus posts. As the alchemical symbol for fire is an upward pointing triangle, we may infer that the triangular pediment here symbolizes the soul, or, better, the discovery of the soul via the “balance of opposites” formula, which is the ultimate end of the Great Work. In one of its meanings, the triangle symbolizes the Path home to the soul. Drawing from my book, Written in Stone. Left: St. Ursula and Her Companions with Pope Ciriacus and St Catherine of Alexandria (1608). Right: Supper at Emmaus (1606) is a painting by the Italian master Caravaggio, housed in the Pinacoteca di Brera in Milan. Thus, the massive triangle-shaped pediments that adorn the apexes of many ancient Greek temples, like the Temple of Nike, are aimed at showing initiates how to rediscover the divinity within their own nature—a theme echoed in the Book & Snake tomb. Triangle-shaped pediments appear on many U.S. Government buildings, including the Supreme Court Building in Washington D.C. In the image below, we see a Deity in the center, recognized exoterically as Moses. Esoterically this Deity symbolizes the divine nature within us. Flanking this Deity are sets of symmetrically balanced opposites, all mirror-images of each other. The greatest opposites are at the extreme, with the slow turtle on one side balanced energetically by the speedy rabbit on the other. U.S. Supreme Court building in Washington D.C.
All the figures inside the pediment converge toward the middle, the triangle´s apex, urging us to transcend the duality or polarity of earthly life and find our center or soul within. A similar meaning is conveyed by Book & Snake´s “ouroboros serpent” symbol, depicted on the society´s regalia. The eternally circling serpent is shown consuming itself. 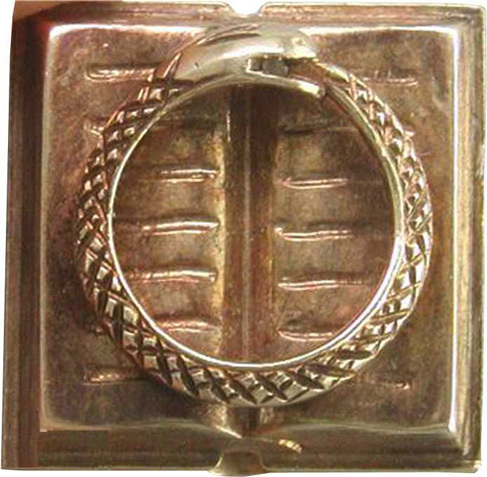 Ouroboros serpent on the Book & Snake regalia. The ouroboros serpent is a symbol of the eternal soul within us, that feeds on the very bodies it uses to manifest itself on the material plane. 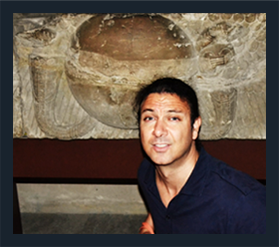 It´s the same circular symbolism depicted by the rings in the mouths of the lions on the Book & Snake tomb´s entrance. With no beginning and no end, the circle symbolizes eternity, and, by extension, our eternal and divine “god-like nature” (i.e., the soul or higher Self within us). 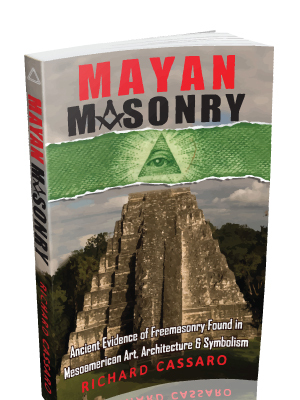 The book on which the ouroboros serpent rests is also symbolic, and we often see it in Masonic art and architecture. 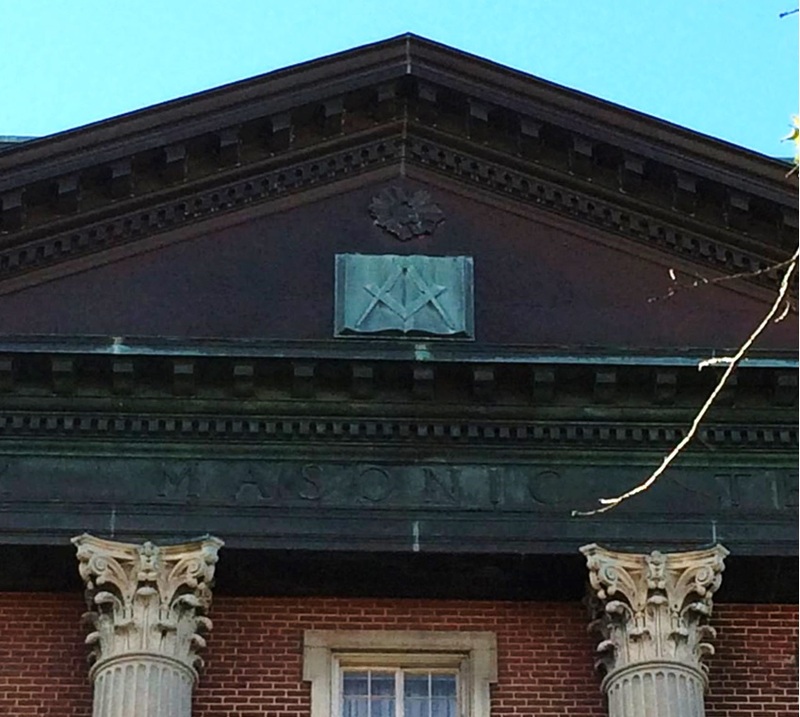 Masonic Temple depicting an open book inside a triangle pediment. The left side of the book signifies “the past.” The right side “the future.” The “centered” spine of the book, like the human spine, balances the twin sides, thus shifting focus towards the center, and pointing to the “eternal now” moment. 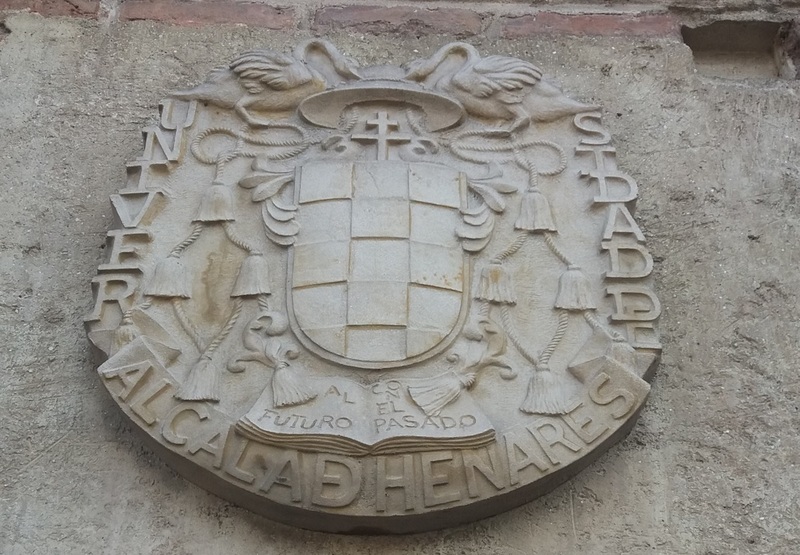 We see this same symbolism in the ancient Spanish city of Alcala´ de Hernares, home to the Complutense University of Madrid, one of the world´s oldest universities. An open book shows the words “pasado” or yesterday on one page and “futuro” or future on the other page, while the book´s spine or center, like the human spine, represents the center or eternal now. An open book shows the words “pasado” or “yesterday” on one page and “futuro” or “future” on the other page. Alcala´ de Hernares, Madrid, Spain. 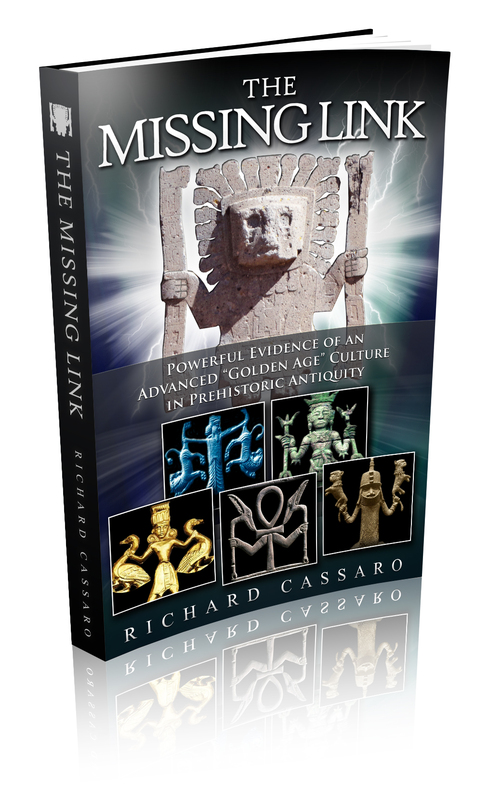 When decoded properly, the art and architecture of the Book & Snake tomb indicates that the Book & Snake Society´s founding purpose was to initiate new members into an ancient Sacred Science wisdom-teaching, the goal of which was to achieve the so-called “Great Work” of spiritual transformation. Whether or not the spirit of this founding purpose is still honored is unknown—but one thing is certain: When conspiracy theorists fail to address the noble origins of Secret Societies, their research becomes a tool of suppression, propaganda, and misinformation.